The Holtwood Power Plant was built in the early years of the 20th century, and has been in continuous operation since 1910. Over the last 15 years, PPL Holtwood has been replacing and upgrading the hydroturbines at the plant. On the occasion of its 100th year of generating electricity, PPL Holtwood embarked on a project in June 2010 to replace the original hydro turbines and turbine shafts on Units 1 and 2. Kingsbury had already reworked the bearing pads on these same units, and our technicians had recommended that the thrust blocks also be replaced. Work on the project began in earnest in 2010 with the teardown of the turbine-generator sets, and in October 2011, our field servicemen went to the site to begin the alignment work. It was no easy task establishing the proper alignment of the units, and our men made several field calls over the next 16 months as the work progressed. 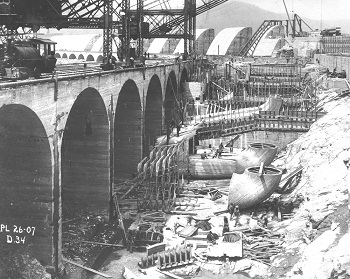 Holtwood Generating Station under construction, ca 1910. In February 2012, PPL Holtwood's plant engineers put the first unit through initial startup, and during low speed operation, the bearing wiped before going into service. In early March 2012, our servicemen pulled out the pads and hand-scraped them. The bearing was reinstalled in Unit 1 in April 2012. PPL Holtwood performed more testing and the unit was operational by early July, but the bearing wiped again. The suspected root cause of the failure was the condition of the thrust runner. PPL Holtwood replaced the original cast-iron piece with one made from steel at Kingsbury's Repair & Service Division in Hatboro, PA (USA). After installing the new runner, our field technicians touched up the adjusting wedges under the pads, which were also refurbished due to the prior wipe. Unit 1 resumed generating electricity as of late August and working a few degrees cooler than the other units. Unit 2 did not experience any failures and went back on line in May 2012. In addition to supervising the bearing revamping work, Kingsbury's technician Gerry Abram was able to establish a system to determine the load applied to the bearings. The pads were fitted for high pressure lift (jacking oil), and by using a pressure gage in the oil supply, he was able to determine the load being applied to each pad. This is critical to assuring the longevity of the bearing, as each pad can now be equally loaded and run within the established safe operating limits. Based on the experience with the Units 1 and 2 thrust bearings, PPL Holtwood will revamp the Unit 9 thrust bearing. Kingsbury's personnel look forward to working with the technicians at Holtwood on this next phase of the project, and to preparing the historical bearings for their next century of use. 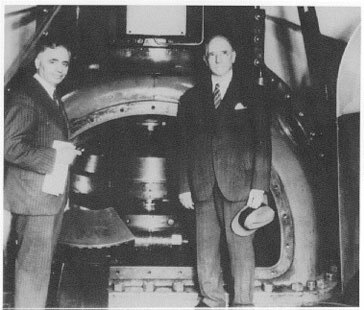 Dr. Albert Kingsbury (right) with plant manager from Pennsylvania Water & Power Company (a PPL Holtwood predecessor) in June 1937, on the occasion of the 25th anniversary of the installation of the first hydrodynamic thrust bearing.